Upside down living which offers 4 bedrooms downstairs with separate bedroom 5/second tv room upstairs adjacent to huge contemporary open plan living space, the views are so fabulous even washing up is a pleasure! North Cornwall offers so much to everyone - the house is near to surfing beaches, such as Polzeath; the Cornish Coastal Path which is a 30 minute walk from the house along a beautiful woodland valley, the famous town of Rock where you can learn to sail etc.. There you are a stone’s throw away from Padstow and the bars, restaurants and shops it has to offer. Just to our north are the legendary Tintagel and the nearly washed away in the floods of 2004, Boscastle. So much to see and do during your holiday that you can be busy all week or simply sit on the first storey deck overlooking stunning views and watch the world go by. Bliss. The 3 of us live in rural North Shropshire along with our 4 dogs, horses, cats, sheep, peacocks and chickens. We have holidayed along the North Cornwall coast as a family for years and also as children going back more years than any of us care to remember! This stretch of North Cornish coast has been a favourite for decades. We favour the estuarine beaches of Daymer Bay and Rock for tranquil walking beside a surf free sea but also love the windswept coast paths and crashing Atlantic ocean. Whether you want to surf, stroll or simply chill out this area keeps drawing us back again and again. Fabulous restaurants and quaint pubs with friendly locals only add to the joy of the area. 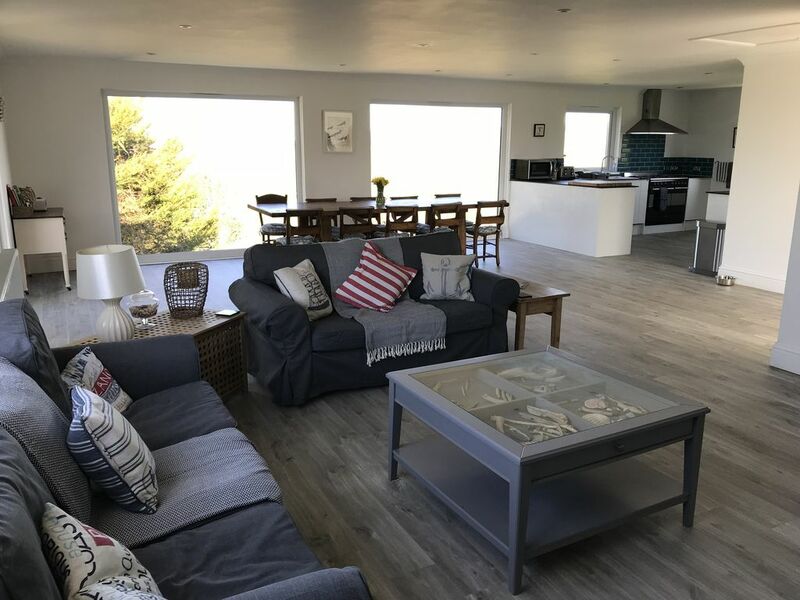 We chose Port View House because it offered something special, even in the depths of winter being able to enjoy the stunning views out to sea makes it a pleasure to visit, along with a woodburning stove to light and watch the storms roll in. Having a great pub less than a minute away and a footpath right down to the coast made the decision to buy that bit easier. Cosy up on stormy days next to the woodburner. Dolce Gusto - remember to order pods when you are making a supermarket delivery order! Plenty of dishes and utensils to make your stay a home from home. Fabulous large table situated next to the picture windows with views to the sea and open countryside. Bluetooth and internet radio etc. There are some DVDs available to watch - both kids and adults - but please bring any you may specifically like. A vast choice of books - please help yourself and if you haven't finished it whilst before you go please feel free to take it home with you. Loads of jigsaws and games e.g. Rummikub and Mastermind will while away the hours if the rain comes down. There are a handful of child sized wetsuits which you are welcome to borrow during your stay. Notes on accommodation: You will find a two king rooms and two twin rooms along with a fifth bedroom upstairs which is generally used as a second t.v. room/play room but can be converted into a bedroom by using the futon. The beautiful kitchen is fully fitted with quality appliances and plenty of wine glasses and crockery to keep you going! Outside: Deck on first floor with lounging furniture Private secured garden and laid to lawn with gravel parking for 5 plus cars. Utility Room: Washing machine and Tumble dryer and clothes airer along with an iron and ironing board as well as a vacuum cleaner and mop and bucket for any mishaps! There is space too to keep bikes should you bring any with you. Cleaning / Towels / Linen / Maid service: All linen and towels provided. Please note beach towels not provided. Other: Second TV Room/Bedroom 5 - 3 seater sofa and 2 seater futon with large flat screen t.v. and DVD player. Fabulous house in an amazing location. Very comfortable and well equipped. House needs some work with damp areas, mouldy/black grouting in showers, oven not fully functional and not clean from last occupants, some areas of house could have been cleaner too but overall a lovely, spaceous holiday home. We had an amazing week with family, friends and the dog. Local people very friendly and helpful especially in the Cornish Arms next door. We would stay here again. Lovely house, plenty of space for our group of 9. Comfy beds, great kitchen and big table so that we could all eat together. Lovely lounge area as well. I'm really glad you enjoyed the house and hope that I can welcome you back again. Also, thank you so much for leaving the house so immaculate. We are not often in the area when guests leave but we were last week so we saw first hand how beautifully you had left it - it makes a huge difference to our changeover guys, so thank you! My family and visitng friend were really happy with Portview House. The immense picture windows looking onto the sea provide views of the ocean and a strong sense of location. The spacious living area/kitchen offers a sense of communality without claustrophobia. The property is extremly well appointed, not just with utilities (cofee machine, microwave, balconies, loungers, barbecue etc.) but also an unusually large array of DVDs, puzzles, games and books for the inevitable rainy days. For the sunnier days you can walk (40 minutes) across country to Port Gaverne from where you are a hop, skip and jump (or a tuk tuk ride) from Port Issac. The local bus which stops outside the pub (almost) next door goes further afield. In a car you are less than 30 minutes from Tintagel, Boscastle, Rock and Padstow ("Padstein") with glorious walks and food for all budgets. In summary a great base for wider exploration and a relaxing location for communal relaxing. We are already contemplating our return and would definitely recommend. With 10 family members spanning three generations, we needed somewhere big to prevent us falling over each other. Port View House is reassuringly big; the first floor open plan living room/kitchen/diner is huge and the large windows make it an airy cheerful place. There are enough decent bedrooms and bathrooms to go round and we like the fact that it is close to lots of local attractions. Grandchildren went to surfing school at Polzeath, we did mackerel fishing from Rock, sampled Pilchards restaurant at Port Gaverne and tried Rick Stein's cooking in Padstow. Loved it! A great holiday home, perfect for two families with plenty of space. Great views ! We had a fantastic week at Port View House. The property is well designed, very clean and well equipped. Polzeath beach is very near which is great for surfing and general beach days. The boys had their first surfing lesson there and loved it. It was a great base to explore the lovely coastline in the area. We would definitely recommend this holiday home. We booked this house for a family of 10 people and 1 dog. what can I say the house was very impressive. Big open plan living space with a balcony . 2 huge picture windows with fantastic views. We were gobsmacked to be honest. Everywhere we went to visit was within easy reach by car, including Port Isaac, Padstow and Newquay. Happy memories made with my family the snug was a god send for the boys age 10 and 12. I would fully recommend this house and we have already recommended it to our friends. Emma was always quick to reply by email and nothing too much trouble. Nearest beach 2 miles away by road. Walk it in 40mins without ever going on a road! Fantastic local pub, 1 minute walk from the house offering good pub food and a Thai menu. There are great seafood restaurants in the area such as Paul Ainsworth's No.6 in Padstow and Outlaw's Fish Kitchen in Port Isaac both of which are in Tatler's Restaurant Guide 2015 and are seriously good. Booking recommended. Too many good pubs and eateries in Port Isaac and nearby villages to mention! Small Co-op in Port Isaac for your essentials with a Tesco and large Co-op in Wadebridge.